In 1630-31, a wave of the plague killed 1/3 of the population of Venice. The city wanted to build a monument to the victims and protect the city through piety. March 2014, single image, additional exposures for highlights, focal length 35mm, aperture f/8, shutter speed 31 seconds, ISO 200, 10-stop ND filter, tripod. The Virgin Mary was chosen as the dedication of the church you see in this photograph since Mary represented the protector of city in many ways. 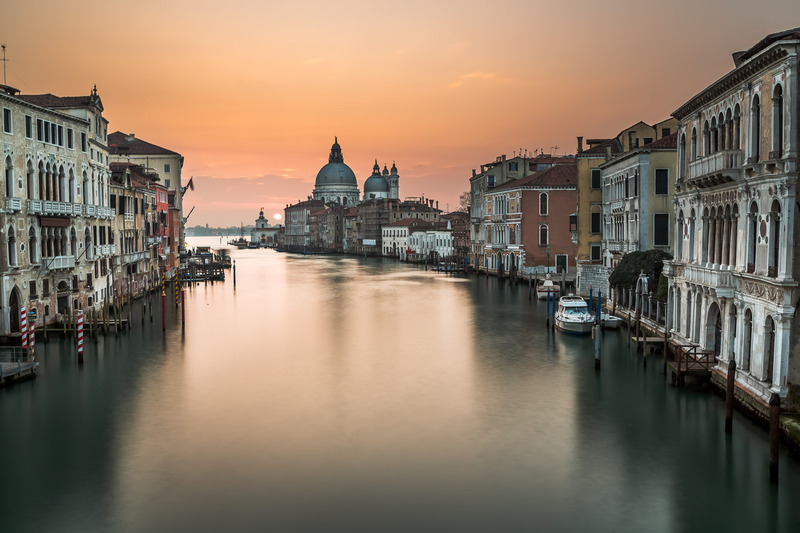 Ever since it was built, the church featured in this photograph, Santa Maria della Salute, has been the inspiration of paintings, photographs and poems. It is an iconic part of the Venice skyline. I’ve mentioned before in Venice it is hard to imagine anything ever had gone wrong in this city. I can’t even begin to fathom how the city must have felt when the plague took nearly 100,000 victims. Even the monument to these deaths offers an enchanting beauty which does reflect the horror for which it honors. When capturing this shot of the Venice skyline the sun is rising offering a golden glow behind the church. To focus the view on the architecture and give the photo more of a haunted feel, I smoothed the surface of the water using long exposure and neutral density filter.